*I am NOT a professional and don’t claim to be. I’m just sharing what I’ve learned and applied in my own life. 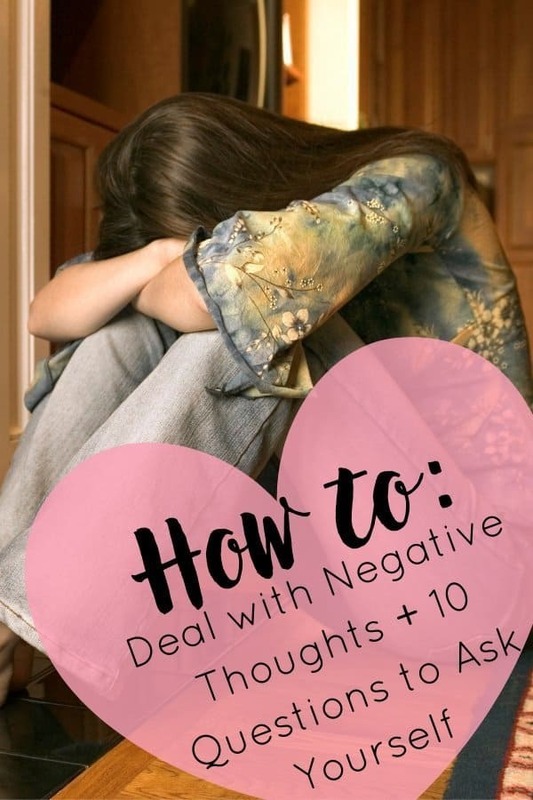 Learning how to deal with negative thoughts is an important tool to have in your arsenal — especially if you struggle with depression and/or anxiety. Negative thoughts can be paralyzing and if you have depression or anxiety, they are always around! The worst thing about negative thoughts is that they can also lead you down a serious rabbit hole of darkness. You’ll start with one negative thought and it can up spiraling out of control pretty quickly. It’s easy to see how you can feel down if racing, negative thoughts are running around in your head. This is probably one of the biggest things I’ve struggled with during times I’m really depressed. Through lots of therapy and some independent research, I have learned how to get myself back to reality before it gets really out of hand. I make a conscious effort to twist those thoughts into something positive instead. There are ways to challenge negative thoughts but it’s not always easy. Therapists are professionals and they have access to all kinds of different tools (usually worksheets) that can help you work through negative thoughts. This is where I first learned about the technique. They teach you how to apply the steps to begin to knock those thoughts out. You’ll basically challenge every negative thought that pops into your head by turning it into something positive. It takes practice but the more you do it, the better you’ll get at it. I promise. Challenging Negative Thoughts On Your Own. I’m Miss Independent Introvert Homebody and if you’re like me, maybe you’d like to work at this on your own. Here are some questions that will help you challenge negative thoughts. Is there evidence to support my thought? What would a close family member or friend think about the situation? If a friend had the same thought, what would I say to them? Will it matter a year from now? Three years from now? Five years from now? Is this way of thinking really helping me? How am I benefiting by thinking this way? Am I confusing thoughts and facts? Is what I’m thinking based on how I feel instead of factual information? How would the thought change if I looked at it in a positive way? Once you begin to learn how to challenge negative thoughts, you’ll begin to notice when you’re starting down that path and you’ll be able to pull yourself right back out. Obviously, it may be easier or harder at times but you’ll start to recognize when it’s happening. If you’re having a really hard time I would definitely suggest seeing a therapist. If you’d like to dig a little deeper I have some recommended reading for you. I personally love having books around because I can open ’em up whenever there’s something I’d like to work on. If you’re going to talk to yourself, you might as well be nice. I have a really hard time doing that some days. It’s easy for me to be nice to other people, why is it such a struggle to have nice thoughts about my own self? And there’s a workbook to go with it! I really appreciate workbooks because they’re filled with helpful exercises that can teach you to apply what you’re learning. It’s kind of like a mental health journal that teaches you a lot about yourself and it can be super interesting to go back and read things you completed weeks, months or years ago. Learning how to deal with negative thoughts will take time and effort but it’s really worth it. You’ll start to learn to realize when you’re starting to go down that hole and you’ll be armed with knowledge and techniques to pull yourself out. Depression and anxiety are hard enough. Having a more positive mindset can help you tackle other coping strategies to make your quality of life better.